My grandfather, Robert C Solomon, operated the Panther Creek coal mines in the Springfield area of Illinois when he was a young man. With a touch of entrepreneurial spirit, it occurred to him to pulverize a mining byproduct of black carbonaceous slate to add color to mortar and cement. During the robust construction of the roaring ’20s as skyscrapers were becoming prolific in downtown Chicago, Robert Solomon seized the opportunity to participate. Solomon Grinding Service was founded in 1927 and began crushing, grinding and blending of various natural minerals including red hematite iron ore from Michigan and yellow ochre from Georgia. Pigments were used first in mortars for aesthetic impact. Contrasting with brick and stone or matching it can create dramatically different results. Sun play on a wall at different times of day and different times of year can also have dynamic results, creating different hues, shadows and highlights. Until the mid-1900s, the color of masonry was largely reliant on the color produced by a geographic region’s natural resources – sand, clay, aggregate and natural iron oxides. Brick and stone have a wide range of natural variety, but grey cement-based concrete block and mortar traditionally have less range. Plain grey instinctively comes to mind when picturing natural concrete masonry units (CMU) or mortar based on their ingredients of portland cement and sand (and aggregate). Even so, natural grey can range from light to dark grey, depending on regional materials and manufacturing differences. Mortar was among the first cement-based construction products in the US to gain interest with added color. Dating back to the 1920s, mortar pigmented with natural hematite ore produced a reddish-brown color that can still be found on buildings, including historic landmarks. In addition to natural hematite iron oxide, powdered black carbonaceous slate from coal mines was used to produce a charcoal/blackish shade of mortar in the 1930s and ’40s that often graced brick walls. Adding a touch or more of this black powder could darken the mortar as accent or contrast. Because mortar joints make up approximately 20% of a masonry wall, a look can be significantly altered with pigmented mortar. As with lifestyle fashion, architectural color trends vary with the times. Natural iron oxides and carbonaceous slate limited the range of shades available. The evolution of synthetic iron oxides expanded the palette of hues and shades, which gave the industry a new colorful dimension. The popularity of synthetic iron oxides’ vast array of color shades slowly diminished the use of natural iron oxides use in masonry. Synthetic iron oxide pigments are produced with four primary colors: black, yellow, yellow-tone red and blue-tone red. Blends of the four primary colors produce an unlimited number of shades. The exceptions are blues and greens which are derived from cobalt blue and chromium oxide green. Pigmented cement-based products have grown to include ready-mix, wet cast concrete, segmental retaining wall (SRW), pavers, decorative concrete as well as CMU and mortar. The coatings industry also relies on the same materials for creating its colors, so ready access to consistent, high-quality pigments has become an integral part of the construction products industry. Iron oxide hasn’t changed in the hundred-plus years that pigments have been added to cement-based concrete products. These minerals are in the stone, the rock in the hillsides, exposed to sun and weather for thousands of years. No other material has proved to be as permanent, sun-fast, weather-stable and cost-effective. 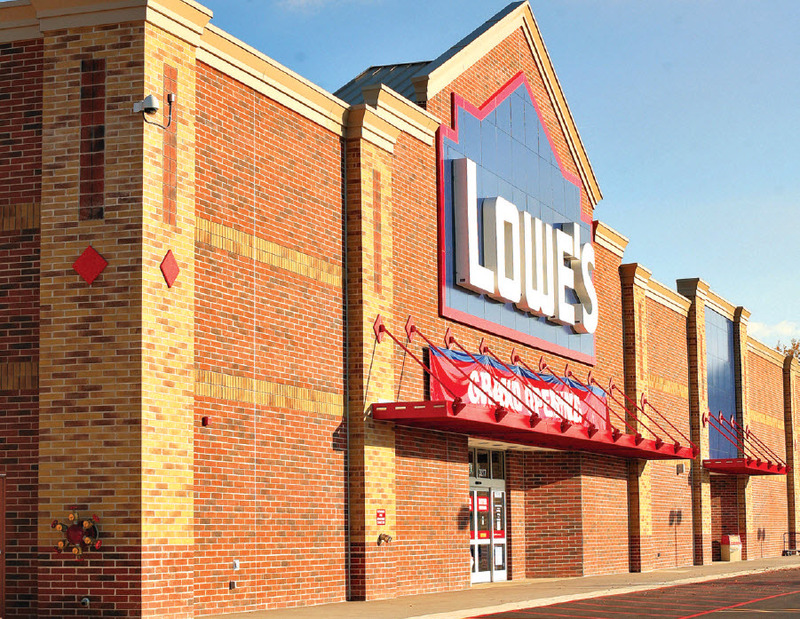 Vividly pigmented concrete masonry half-high units used in distinctive arrangements of coursing patterns and accent details elicits rave reviews from Rochester Hills MI planning commissioners, Lowes’ construction officials and neighbors. Ordinance in upscale Rochester Hills requires a building have a brick-like exterior on all sides. Earth-toned blends complementing red scored half-high single wythe CMU met the budget and began a new trend. With the increased productivity of CMU production, there was interest and capability to integrally pigment units as well. In the 1960s, coinciding with the new faces of block along with its myriad new shapes, variety of textures and finishes that these same pigments found their way into CMU manufacturing. With the rough, stone-like appearance of split-face CMU, producers were eager to add integral pigment for even more authentic stone appearance in an expanded palette for a more robust product line. Enriched deep colors of charcoal, golden, burnt orange and rose tones are effectively contrasted with smooth and split face finishes to break up expansive walls bringing appearance to human scale in this 42' tall, solidly grouted 12" CMU wall system achieving a magnificent aesthetic for this large sound-isolating theater wall. Until the 1970s, all measurement and batching was done by hand. The addition of automation in manufacturing increased industry growth by ensuring accuracy, product uniformity with exact timing, measurement and verification of pigment in the mix design. 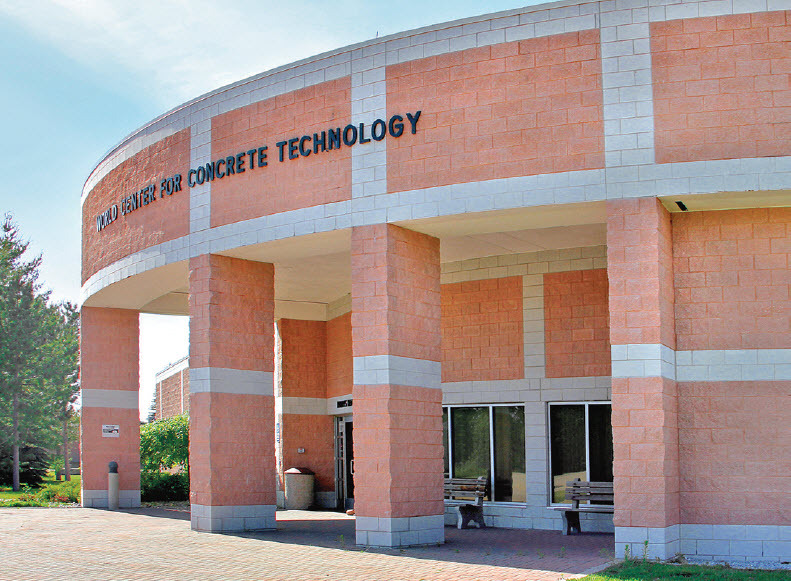 Several colors of A Jandris & Sons split face concrete masonry units are pigmented – with mortar to match – to create a design that recalls the Earth’s geological strata to tie into the curriculum of an earth science themed Interdistrict Discovery Magnet K-8 school in Bridgeport CT. The dramatically layered and curving wall also serves the purpose of wayfinding to the main corridor and continues outside to the school’s exterior. Brightly colored glazed block combine with integrally-pigmented concrete masonry to creat an eye-catching and innovative facade for this multi-family housing complex, Wentworth Commons on Chicago’s South Side. It was also in the 1970s that powdered pigments were replaced by liquids. Iron oxide added to liquid (water) with surfactants disperses the color. Liquid pigments were good for automation because now they could be easily moved, measured and pumped. Aside from the cost of the pigment itself, adding pigment through automated liquid did not add additional labor or production cost. Ease of use helped expand the colored concrete product market, giving customers more selection with minimal cost. Liquid pigments began to be replaced in the 1980s by a spray-dried granular product. This eliminated any issues with extended shelf life and solid elements settling in the liquid, infinitely extending shelf life of the pigments. It is hard to imagine now that there may be a CMU producer that does not make a pigmented concrete masonry unit. There are a lot of processes in place that simplify a producer’s ability to take advantage of all that’s possible regarding integrally-colored, cement-based concrete products. Producers have nearly a half century of experience with mix ratios, tinting strengths, curing, etc, so production uniformity is no longer a concern. They are better able to help designers achieve their ideal material colors. Three faces of pigment 49 at The World Center for Concrete Technology, Alpena MI, show dramatic variations as one color can appear quite differently with various finishes of elegant burnished and vivid glazed interior walls with textural split face exterior curvilinear walls. More and more, schools, sports facilities and corporations are choosing architectural materials in their team and company colors to build their brand with a sense of inclusiveness. Integrally-pigmented CMU, mortar and other concrete products make this possible. The same color pigment applied to CMU with various face finishes creates strikingly different looks. Split and ground face examples are framed by two courses of white units at The World Center for Concrete Technology for dramatic effect. Titanium dioxide produces a clean, white product, and when combined with white cement and white aggregate, snow white CMU is possible. Used on internal walls, it can reflect light lowering a lifetime of lighting costs. Outside, white can help reduce heat islands by reflecting rather than absorbing the sun’s heat. 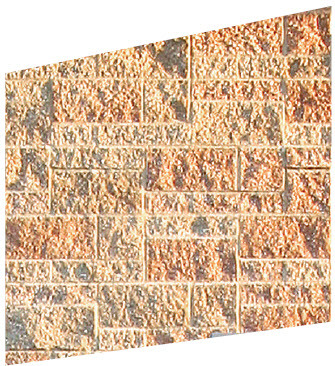 Variegated color within concrete masonry units is possible with colors folded together, rather than blended, producing a more unique brick-like appearance pleasing to designers and owners. Especially when used on half-high units which are made to resemble brick. Burnished units with faces ground showcase the aggregate color, shape and texture. Pigments only bond with the cementitious materials. Pigment added to the mix design can act as a complement or contrast to the aggregate for dramatic effect. 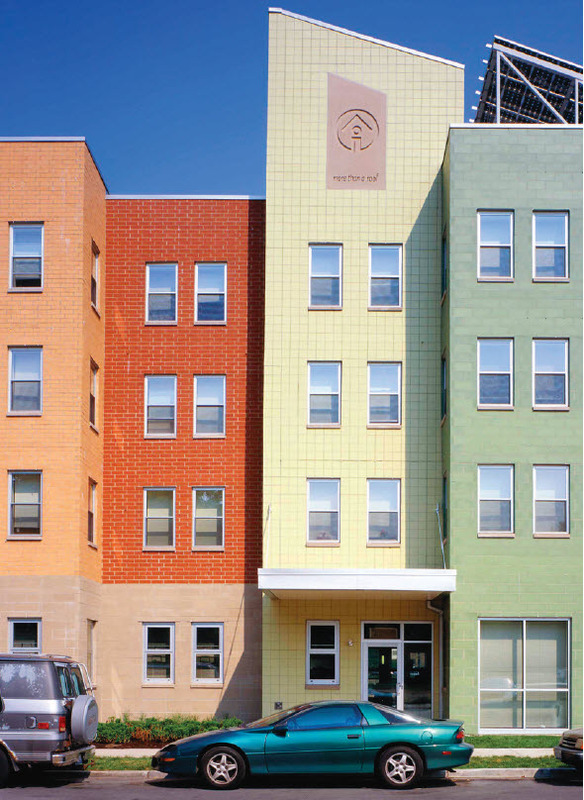 Integral pigments in CMU provide architects yet another cost effective choice in their design palette. Perfect for corporate and school identity branding. Distinctive for wayfinding, particularly in large buildings, statement as accent to a vibrant cityscape. Bright colors | earth tones | jewel tones | neutrals | mineral tones | even various shades of greys can become a fabric to make a signature statement. Iron oxide pigments are consistently uniform and easy to design, whether using one or myriad colors. Richard Solomon is CEO & chairman of the board of Solomon Colors, Springfield IL, with manufacturing plants in Springfield IL and Rialto CA. Solomon Colors manufactures a complete line of mortar colors, dry, liquid and granular iron oxide pigments and automated pigment dispensing equipment to the masonry industry. 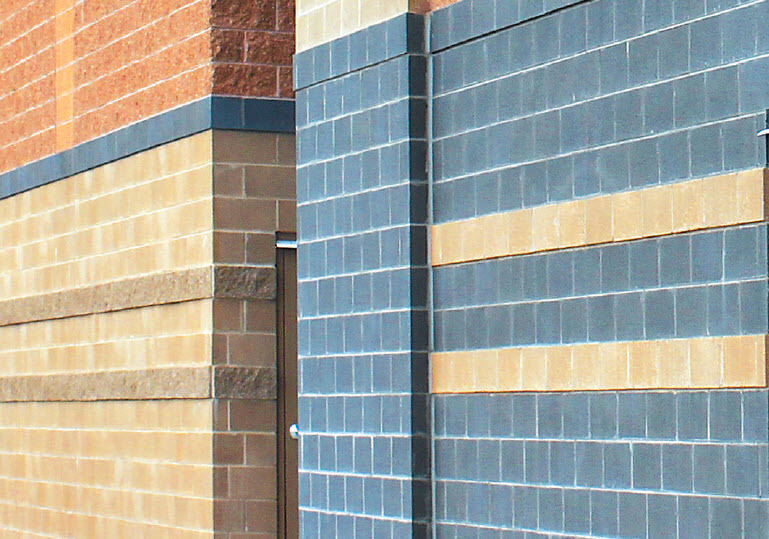 Since 1979, Solomon has been active with promoting the use of color in masonry projects to architects, concrete product producers, brick and masonry supply distributors, and mason contractors. He is a strong advocate, long standing member, and financial supporter of the NCMA, MCAA, BIA and ICPI organizations. 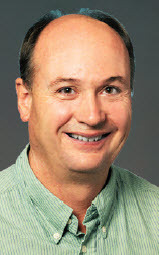 Rich Solomon received his Bachelor of Science from Northern Illinois University.